After what felt like an eternity of talking to what seemed like a brick wall, I suddenly made a breakthrough. I’d been telling both the Orthopaedic and Infection Teams that I was in a lot of pain, I’d had some puss discharge from the original abscess hole, been going backwards with how much I could do compared to the few weeks before etc. etc. All they would say to me was “well you’ve had a lot of surgery on that knee.” and “The soft tissue and the knee in general is looking really good (on the outside).”, no one was actually feeling or examining it, just staring at it from a far. On Tuesday 25th February I was talking to the Infection Consultant, I told him that I know we don’t have X-ray vision and can’t see what’s going on in there but I have the advantage of being able to feel it. It felt painful and was getting worse and I was frustrated that people kept reciting the same thing and not really listening to me. The Consultant apologised and said that he was probably as guilty as the next person. He said that he would have a word with my Orthopaedic Consultant and see if he could suggest a plan. On Thursday 27th February the Orthopaedic Consultant came round and actually examined the knee. He held the leg up and pushed the bottom half of the leg sideways while pulling the top half the opposite way. This was painful to say the least and he told me there was more movement in the joint now than after the surgery. This is normal as the soft tissue settles down but they would send me for an X-ray to check on the cement spacer. He also said that he would send me for an Ultrasound at the beginning of next week to see if they could see any sign of infection in the knee. When I went down for the X-ray they asked if they could put a foam block under the knee. I knew this was going to be painful but if it gave a better picture then I was happy to go along with it. It was a triangular shape and with the rigid cement spacer there is only a tiny amount of bend. They placed my knee on the foam and slowly lowered it down. There was just enough bend to make it work but because it was so painful they knew they had to work quickly to get both X-rays done. Thankfully, as usual, they didn’t hang about and I was soon back on my Hospital bed waiting to go back to the Ward. As I expected, when the results came back the next day, the cement spacer was fine and still in place. That afternoon I had my first shower since I’ve been in here. I’ve been using shampoo caps to wash my hair, which are an absolute God send. I had my leg on a footstall, which meant it was going downhill at a bit of an angle. The water was amazing on my skin, both the feeling and warmth of it. I could quite easily have sat there all day it felt so good. It was hard work and painful though, as good as it feels I won’t be having that many showers just yet. What with the Consultant examining the knee in the morning, then the X-ray and finally the shower it was all too much for the knee. By the evening I could tell from the pain that I’d done way too much for one day, pathetic really. On Tuesday 4th March I was taken back down to the X-ray unit to have my Ultrasound done. There was talk of the Aspiration being done on the Thursday, as that would have been the two week mark since they’d stopped the antibiotics. I asked the guy who was doing it if he was Aspirating or just doing the Ultrasound. He told me they hadn’t asked for the Aspiration but he could do it if I wanted. It made sense for me to get it done then instead of making another trip down there two days later. He had a look at the knee with the Ultrasound and found dark areas, which indicated inflammation that could be harbouring infection. After a circuit round the knee he double checked I wanted the Aspiration done and then got all the bits out ready to proceed. He injected local anaesthetic into the joint on the opposite side of the knee to where puss has been coming out of. They do this so there’s no chance that anything from that side can contaminate the test results. He changed the syringe and drew back on it to collect a sample but nothing happened. There was no blood, fluid, puss, nothing, the syringe remained completely clean, he tried again but the same thing happened. I begged him to try and get something out of there so they could send it away for testing. He put in more local anaesthetic, tried different angles and depths but the same thing happened. He told me that there was a negative pressure in there, apparently that happens in a small amount of people (I had to be one of that small amount of people didn’t I!). 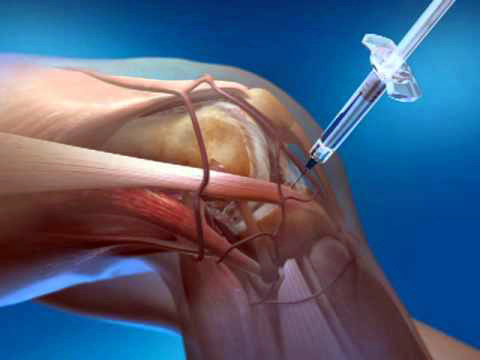 This means that when they draw back on the syringe the negative pressure holds the fluid in the joint. In a last ditched attempt he injected some Saline solution into the knee to try and flush it a bit. After that he had a go at drawing back a bit and a tiny bit started to appear in the syringe. He started pressing around the knee and although it was extremely painful I told him to carry on and get as much as he could so they had enough to test. Eventually there was enough in there to be sent away to Microbiology, all we could do then is wait a week to get the results back.